Habey has just launched its new electronic products, Habey 12 Panel PC. Judging from appearances, this computer has a resemblance with a tablet and nettop computers (mini desktop). The ability of the computer is pretty standard. 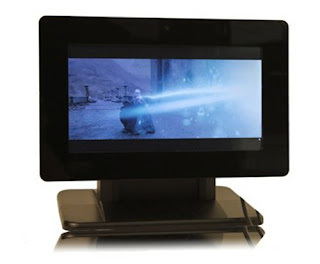 By relying on dual-core processors Intel Atom 1.8 GHz, this computer can be used as a means to automate your home, as part of a home theater system, or as a kiosk system. Display the computer is becoming the one thing that is quite a plus. With 12-inch touch screen, and supported platform NVIDIA ION 2, making it look nice. Not only that, the monitor also comes with access to the VGA and HDMI port, 4 USB ports, and several other ports, including Port eSATA and S / PDIF optical output. At the top of the monitor also has a 1.3 megapixel camera. You can run this computer with different operating systems, including Windows 7, or Linux. This computer has two 2.5 inch hard drive size and two DDR3 memory slots that can be upgraded up to 4GB of RAM. In conclusion, this computer looks pretty good for a nettop. But the price is quite expensive, $ 800 or USD 6 million, you can buy another computer with higher specs. Habey is a branch of Norco Intelligent Technology of China, based in North America. The company is centered on the development of computer applications, such as factory automation, computer integration in telecommunications systems, security systems, and others.